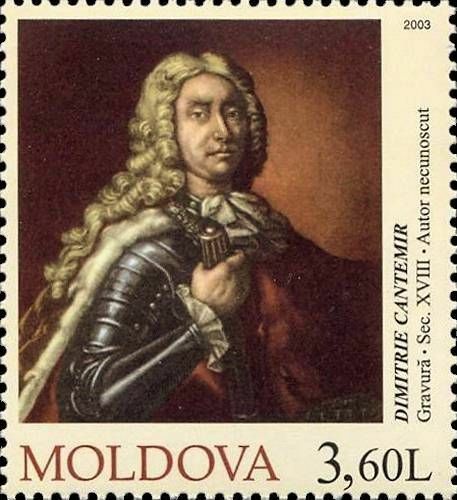 On 24 October 2003, the Post Office of Moldova (Poșta Moldovei) issued a postage stamp with the title Year of Dimitrie Cantemir. The issue comprises one stamp, with an associated cancellation (postmark) and first day cover (FDC). The designer was Vitalie Roşca. The printing was performed by Cartor Security Printing, France. Dimitrie Cantemir (Romanian: [diˈmitri.e kanteˈmir]; 1673–1723) was twice Prince of Moldavia (in March–April 1693 and in 1710–1711). He was also a prolific man of letters – philosopher, historian, composer, musicologist, linguist, ethnographer, and geographer. His name is Дми́трий Константи́нович Кантеми́р (Dmitriy Konstantinovich Kantemir) in Russian, Dimitri Kantemiroğlu in Turkish, Dymitr Kantemir in Polish, and Δημήτριος Καντιμήρης (Dimitrios Kantimiris) in Greek. Read more.. This article uses material from the Wikipedia article 'Dimitrie_Cantemir', which is released under the Creative Commons Attribution-Share-Alike License 3.0.